Heart disease is the leading cause of death in the United States, taking the lives of about 610,000 people every year. However, there are certain risk factors that make some people more likely to develop heart disease. Those risk factors are divided into two categories; modifiable risk factors which you can control, like weight, and non-modifiable risk factors which you can’t control, such as genetics. Quit Smoking- If you do smoke, one of the most crucial steps you can take to reduce your risk of heart disease is to quit smoking. Smoking causes plaque buildup in the arteries, which will eventually lead to the hardening of the arteries. Not only does smoking damage your organs, it also worsens other risk factors for heart disease. It lowers your amount of good cholesterol and raises blood pressure, which in turn, can cause increased stress on your arteries. In just one year after quitting, your risk for heart disease is reduced by 50%. 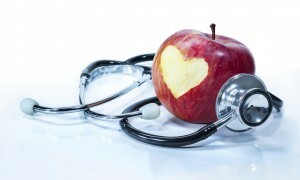 Heart Healthy Diet- Your nutrition and diet play a big role in heart disease prevention. According to research, a diet that’s high in raw fruits and vegetables, whole grains and omega-3 fatty acids can go a long way in reducing your risk of heart disease. You’ll also need to avoid or limit food or beverages that can worsen heart disease. This includes foods and drinks high in salt and sugar, alcoholic beverages, and foods that contain partially hydrogenated vegetable oil. It’s also important for you to watch your calorie intake. Focus on eating foods that are high in nutrients and low in calories. Exercise- Exercise and maintaining a healthy weight are both vital in lowering blood pressure and preventing heart disease. Most experts recommend getting 30 to 60 minutes of exercise a day, or most days of the week. Your exercise doesn’t even have to be intense. Activities such as taking your dog for a walk, doing some gardening or cleaning your house all count as exercise. The main goal of exercising is to maintain a healthy weight. Maintaining a healthy weight will help lower blood pressure and reduce risks for other health complications. Lower Blood Pressure- Hypertension, commonly referred to as high blood pressure, is known as “the silent killer” since it usually goes without symptoms in most people. High blood pressure can contribute to heart disease and cause increased stress on your cardiovascular system. You can lower your blood pressure by exercising, eating heart healthy, managing weight, avoiding stress, and smoking. If you do have high blood pressure, work closely with your health care provider and monitor your blood pressure regularly. Avoid Stress- Though it’s still not fully understood, there is a link between people who experience high amounts of stress for long periods of time and heart disease. Stress can cause pain, headaches, sleep loss and body exhaustion. If you deal with chronic stress, it can cause your heart to work harder and worsen any other risk factors for heart disease you may have. Exercise, yoga, meditation and letting go of worries are all things you can do to reduce your stress. Manage Diabetes- Diabetes is a very serious risk factor for heart disease. If you do have this medical condition, be sure monitor your blood sugar levels. Your health care provider may recommend certain lifestyle changes to help keep your blood sugar under control. Those certain lifestyle changes will help reduce your risk for heart disease. While being diagnosed with heart disease can be quite alarming, there are many lifestyles choices you can make to help prevent this terrible disease. All of the things mentioned above can have a significant impact on heart disease prevention. Make yourself a priority and ask Dr. Gordon Gunn about his Lifestyle Longevity Program by contacting his office in Fullerton, CA at 714-912-2211 or visit www.gordongunnmd.com for additional information. Dr. Gordon Gunn proudly serves Buena Park, La Mirada, Diamond Bar, Walnut Creek and surrounding area.